The Natural Resources Foundation of Wisconsin has awarded a total of $5,447 to 11 schools through the Go Outside Fund (GO Fund). The GO Fund provides funding to teachers to bring environmental education for students outside of the classroom by helping to pay for field supplies, substitute teachers, transportation or assistance from resource professionals and educators. Brillion Middle School students take science outside to test water quality. Photo by Jessica Peterson. Brillion Middle School students have been contributing to statewide water quality monitoring efforts through the Water Action Volunteer Program, a vital citizen science initiative. 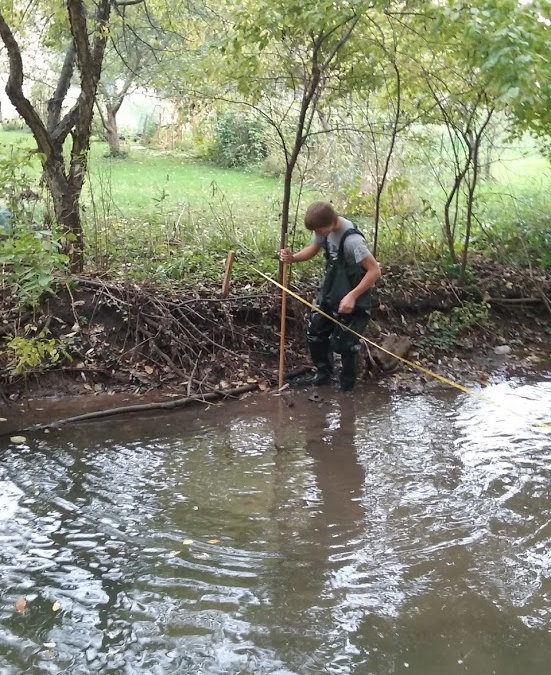 Students have primarily been monitoring degraded water streams, like Spring Creek, but with the GO Fund grant, science teacher, Jessica Peterson, hopes to take her students to monitor a high-quality stream. “Thanks to the funding provided through the Go Fund, the students will be able to visit and complete water testing at a high-quality stream/river,” Peterson said. In doing so, students will be able to develop a plan, to improve Spring Creek by comparing conditions to the high-quality stream. Malcolm Shabazz City High School intends to use their GO Fund grant to expand a rain garden at their school. They will be studying watershed dynamics, urban runoff and infiltration to understand ways that water quality can be improved through the creation of a rain garden as a part of Project Green Teen. “I’m starting to look at the land differently. I see possibilities for rain gardens everywhere,” said junior Charlotte Connor. Students will also participate in a canoeing expedition through a local watershed. The trip will conclude at a drainage ditch at the back of a local parking lot that is filled with urban runoff for students to see how pollution manifests itself. “Some time after the storm water walk, we found a ditch about two miles from Shabazz where the water from the local watershed, that the school is in, goes to. It was pretty gross and helped to motivate students to want to do something about it,” said Aaron Kaio, a teacher at Shabazz High School. Many schools will also be sending their students to Trees for Tomorrow with the GO Fund grant. Students will participate in field studies of the forests, lakes, streams and bogs of the Northwoods while also learning about the history of Wisconsin lands. They will also actively learn about sustainable lifestyle choices and participate in a variety of activities like canoeing and hiking. The Natural Resources Foundation of Wisconsin would like to congratulate this round of GO Fund recipients and wish them well on their outdoor adventures.